Happy Monday everyone.. 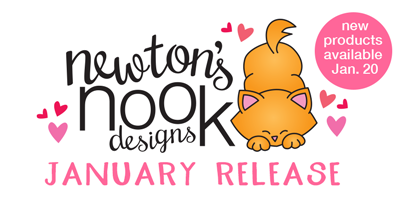 It's time for a new release from Newton's Nook and you are going to Love what we have for you this month! Our first set this month is called Woodland Duos and it coordinates with the current Darling Hearts die. Be sure to join us each day this week for a new Reveal. The entire release will be available in the shop on Friday! 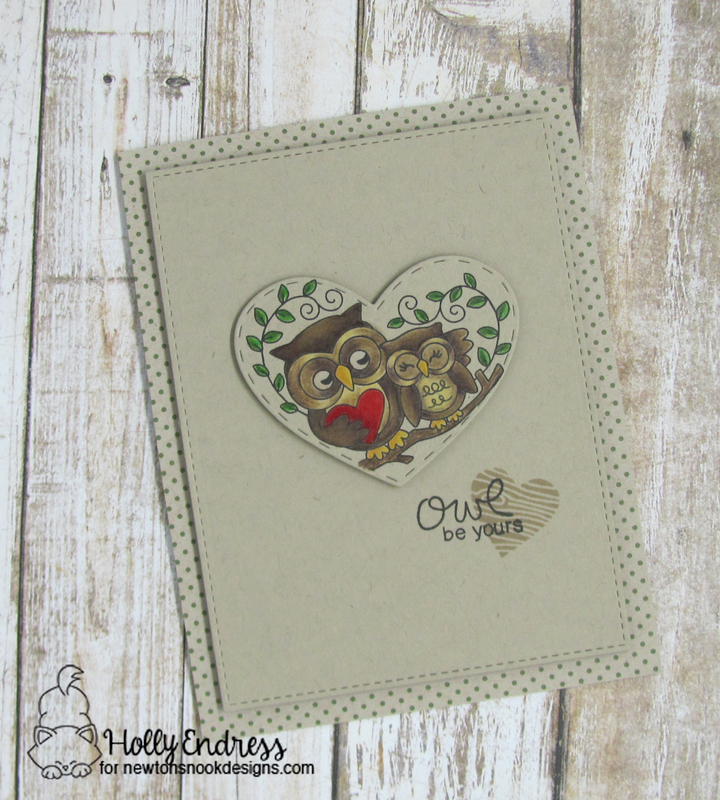 I stamped the Owl image onto a piece of Kraft card stock and then I die cut the image using the Darling Hearts die. I colored the images in with Prismacolor pencils. I used the Misti to stamp my image and I left the negative die in place while I colored the images. After it was colored I put the image back into the Misti and stamped it again. This helps bring the outline back that you can lose with Colored Pencils. I created a Kraft A2 size card base and I added a piece of pattern paper to the front. I also die cut a piece of Kraft paper using a stitched rectangle die and stamped the small heart from the set in some brown ink. Then I stamped the sentiment over in it Black ink. I adhered the panel to the front of the card. Then I adhered the Owl image with some foam adhesive. This is such a darling set! Would you like to win the “Woodland Duos” Stamp Set? Wonderful card! The owls are so sweet! Love the sentiment on the little heart too. 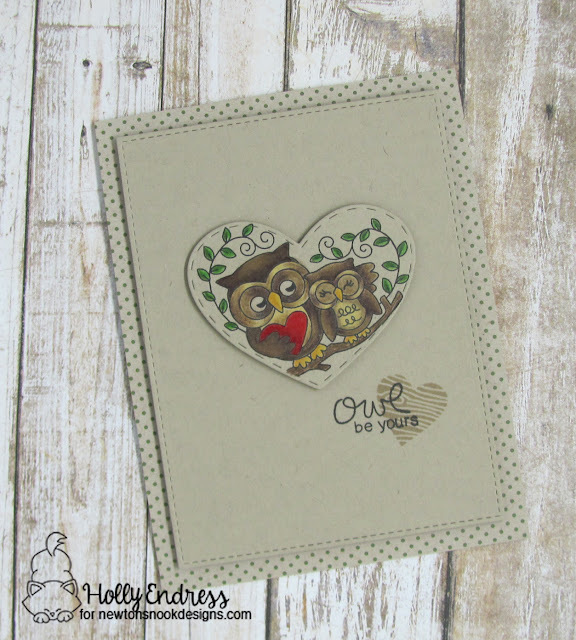 Holly, your owls are so adorable and I love how you stamped that little heart right into the sentiment like that. What a cute little added touch! Those sweet owls are my favorite. So cute! And I love the woodsy, natural feel of your pretty card. Oh my!!! Such adorable card!!! Love Woodland Duos stamp set!!! Cool card. Subtle and attractive. This card is so pretty! I like your tip about stamping it twice but with my luck I'd mess it up even WITH the misti! 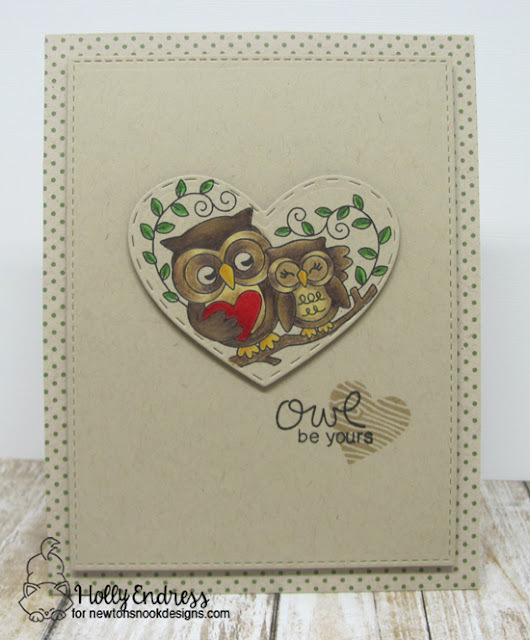 :) The owls on the Kraft paper work so well together! Thanks for the adorable card today! Aww - this is just so sweet!! I love the kraft base and the sweetly colored images. The little woodgrain heart is just the perfect touch! Adorable card. Beautiful colouring on Kraft with the pencils. I love that you used kraft cardstock for this card and all faux stitching with these cute owls! Oh this is sweet! Love your coloring with pencils, and the great idea of re-stamping after coloring. Love these owls and how you've colored them over the kraft card stock! :) So cute! Love your coloring! Amazing card! And thanks for the tips as well! Thanks for sharing! I love the owls and this would be perfect for Valentine's cards. Using the Misti, makes doing duplicates so simple. I am now inspired! Thank You! Love your colouring on kraft...this is something I enjoy doing too. Sweet card! The owls are adorable! this looks really amazing on craft. Well done! What a darling card. Love your choice of Kraft as background for these dear critters. Your owl card is super adorable! Those owls are so cute. Aw, kraft card stock and owls - Perfect! I LOVE these sweet owls! This is really adorable! Love the design of your card! Great hint about restamping after coloring with pencils. How sweet. I like the coloring on kraft. I love your card, I really like the look of coloring on kraft paper. The kraft background is perfect for these cuddly owls! lovely card. really love your color palette, and what a great tip for using the Misti tool, too! Love how they are encased in the heart. gorgeous card!! it looks very elegant with the sober colors used. i love it! I think the owls are my favorite!! 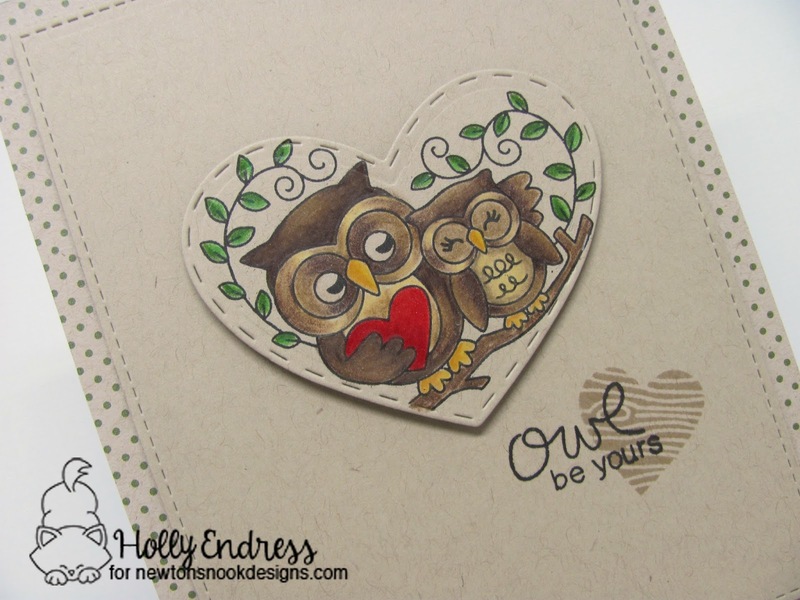 I love your use of blending and shadows on your owls-beautiful card! Super cute card! Your coloring is lovely! This really is a darling set, I agree with you! Thank you for the tip about putting the image back in after coloring and stamping again. I like to use Prismacolors too, and I know what you mean about losing the details of some of the lines. I have always come back in with a black fine liner, but this is much easier and more precise so I appreciated the tip. 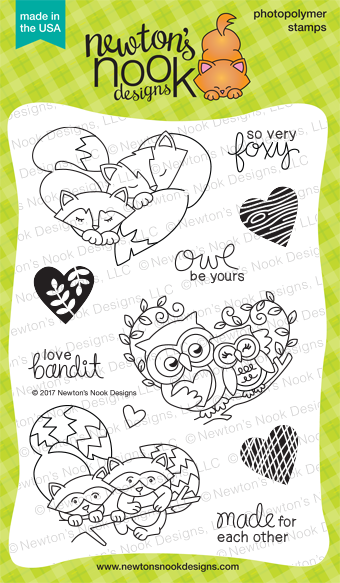 I think your owls are simply adorable and love how the whole card came together, I see this as a very versatile stamp set.